They are people just don't want to see MS doing anything good. Shows these people are clueless. And lMAO at that Ybbara reply . Not fooling anybody. Maybe Eventide 3: Legacy of Legends? Street Fighter 30th Anniversary Edition? Broken Age: The Complete Collection? The marketing team keeping things interesting. Finally got around to giving ReCore a shot because of gamepass. 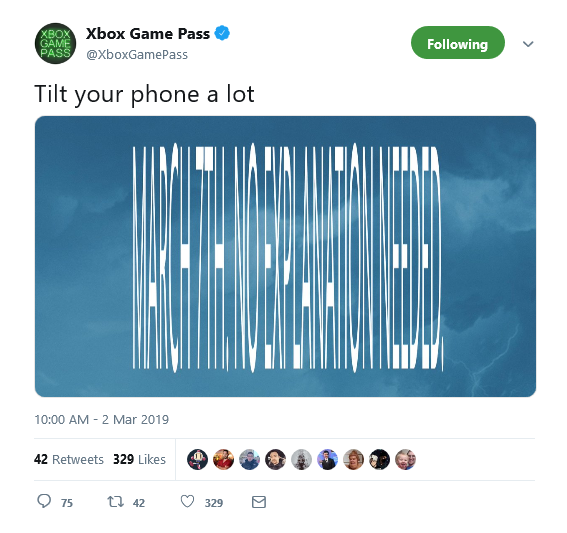 Microsoft really should invest into it as AA-AAA franchise. The protagonist is great, the concept of the game is cool, and dungeons, I zelda like dungeons. Game has a lot of potential to be something great. Hope Microsoft realizes this. I've been meaning to try it. I need to. Nice Shadow of the Tomb Raider! Don't care for the others. TWD Season 1 isn't really a big deal lol, but Tomb Raider is good and I'm very interested in batman. 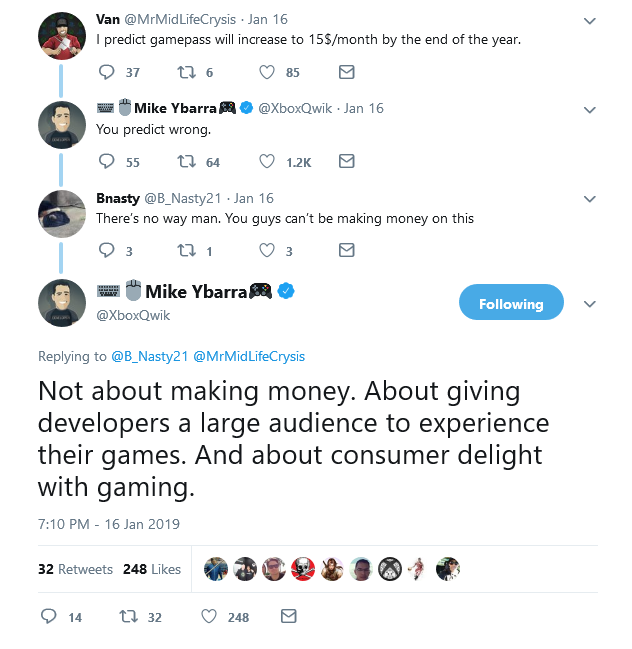 Michael Worosz, head of Take-Two’s Private Division, a label started specifically to fund and publish similar mid-tier games, said in an interview with MCVUK, also adding that even in the event that they do prove Game Pass’ worth, not every studio will be up for an acquisition anyway. “Right now it seems clear that Microsoft is trying to accrue value to their Game Pass value proposition, by having uniquely available content there,” he said. 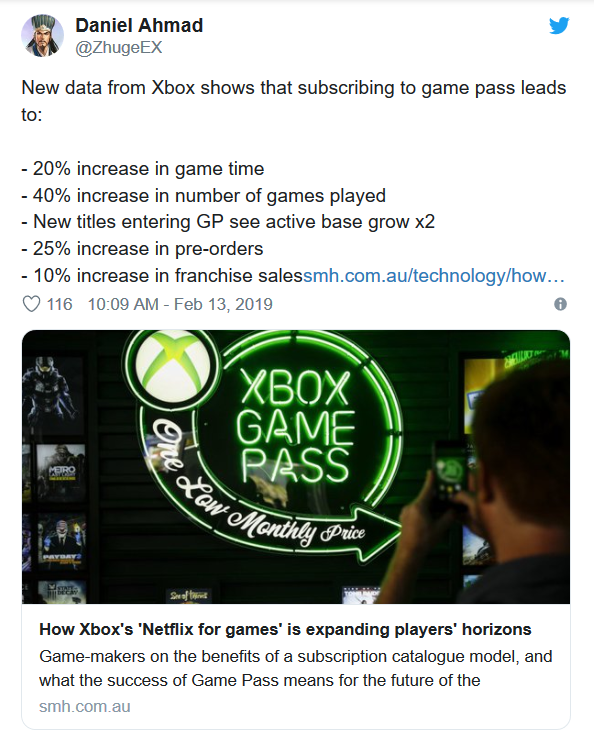 “I think that makes sense to a degree, I think they’re going to have to demonstrate Game Pass’s growth over time to be able to continue to do acquisitions like this, and if it does work for them, then I can see them doing more acquisitions to build out exclusive content. If you don’t have Game Pass you can get two months for $2 on the dashboard. My 6 month card expired last month, just picked it back up. That’s the good Alien game right? I think I'm going to need some explanation. Great that JC4 is on Gamepass but considering how soon it, and Shadow of the Tomb Raider, showed up on there probably means those two Square Enix games sold poorly. Agreed, but GP seems to give games a second life so hopefully a lot more people will play it now....including me!